We go a bit further on the timeline of warfare in Europe and are visiting the 70-ties and 80-ties. The Dutch landforces had their primary Nato assigned mission in Germany and had to prevent a Russian attack in a designated area. Every country, part of Nato, had to support their own troups from the motherland. These logistic efforts needed good communications for the supporting units in the Netherlands. The communication with the forces in Germany was vital too. In those days the primary written contact was made by means of teletype (telex). As the word says: typing on a machine at one end and reading it on paper at the far end. The management of the logistics however required a system that could send messages to more than one address simultaneously. This store and forward function for the telex messages was the primary function of this bunker. The mainbody of the bunker was built in 1953. 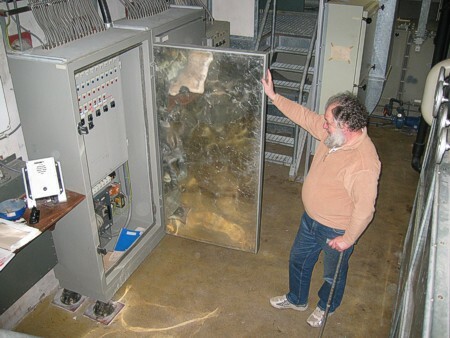 Years later the interior was completely renovated to protect all electronics from the EMP (electro magnetic pulse). This high powered pulse is a side effect of a nulear explosion and would destroy all unprotected electrical equipment. This bunker has two levels and the central core has a two story high cage, which provided EMP shielding with seamless copper plates. Additional pictures by Peter Heijkoop. Note that the inside of the door of this cabinet is covered with a copper plate.